The British Soling Association held its 2015 National Championships/50th Anniversary Regatta on 12 – 14 June at Rutland Water in Rutland, one of England’s smallest counties in the heart of England. This was the first British National Championship held since 2010 and was held at the home of the newest Soling fleet in Great Britain. Rutland Sailing Club had only one Soling two years ago. Now there are five. Rutland Water is one of Europe’s largest man-made lakes and was created by the building of a 35 metre high dam at Normanton. Most of the town of Normanton lies beneath the water. The upper part/steeple of Normanton church rises up out of the water near the shore and is still used for weddings. The lake is a large bird sanctuary for many species of bird, most notably the osprey. Rutland Water is also a fishing lake teeming with trout, roach, bream, pike zander, perch, eel and carp. There is a footpath and cycle track around the lake which is 40 kilometres long. Rutland Sailing Club (RSC) is situated on the south shore beside the village of Edith Weston and is one of the largest and most active inland sailing clubs in the UK. Rutland Water is horseshoe shaped which means changing winds as you navigate from one part of the lake to another because of the influence of land masses, in addition to other typical weather variations. There were eight boats on the starting line for each race but the last. Boats came from Fort William in Scotland, Fleetwood in the Northwest, Barry in Wales and Blyth in the Northeast. In addition there were two Solings from Rutland Sailing Club, one (Dirty Harry) was crewed by an all French team who flew from Perpignan to compete. Gary Richardson flew in early from Darwin, Australia to helm BUZZ (GBR155) in the event. The weather varied from brilliant sunshine to grey and raining. Winds also varied from upwards towards 15 knots down to next to nothing for short periods. The racing was varied and challenging. The first day gave excellent conditions with a fairly steady Easterly wind of 15 knots blowing over the lake. A standard triangle and sausage course with a first beat of over one mile was set. Gary Richardson in Buzz overtook Solaris skippered by Hamish Loudon (who was drawn too close to the shore by Normanton church having been lured there by the call of the wedding bagpipes playing) on the first run and remained in front until the finish. Running Bear (Tony Freeth) was a close third, then came Contagious (Derek Priestly). After a break for lunch the fleet enjoyed two good races over the same course With Masala Mags (Mark Fisher) winning race two. On Friday evening the score card read, Buzz 7, Running Bear 8, Contagious 9, Solaris 10.Masala Mags 11. Saturday brought the rain with the wind of 12 knots backed to NE but with some variations. The first class Race Officer and his team moved the course between races with the minimum of delay. After the three races back to back the wet eight crews were glad to head for the bar, and a Class meeting. With two races to come on Sunday the scores with one discard, read, Running Bear 8, Buzz 11, Solaris 14, Contagious 14.and Mags 20. On Sunday morning the breeze had dropped to 8-10 knots variable and backed further to the north. 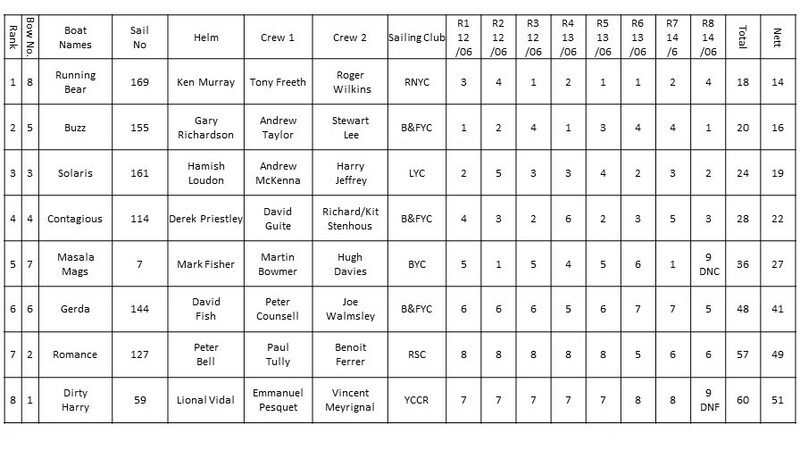 In both races the places changed regularly but Tony Freeth and his crew held on to win overall. Buzz closed the gap slightly with a win in the last race. 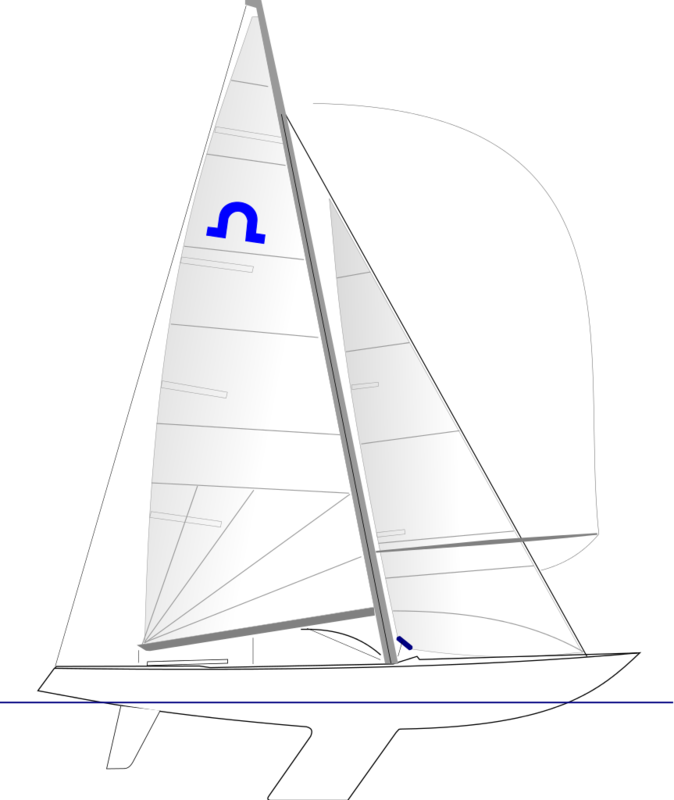 Solaris remained in third overall. All eight races were very close, often with less than a boat length separating the first three finishers. The Race Officer and his team did an excellent job! The accommodation and catering facilities at Rutland Sailing Club were superb including a formal gourmet meal on Saturday night. All competitors were presented with commemorative Gill polo shirts by the BSA which they all wore proudly. The BSA has to say a huge thank you to Rutland Sailing Club, our hosts, for sharing their fantastic venue and facilities with us for this important commemorative regatta. Rutland Sailing club has modern pontoons, concrete slipways, and a very accessible hard stand area with an “A” frame and chain block hoist that made it easy to transfer boats between road trailers and the launching trailers provided by the local Rutland Soling fleet. Boats were left overnight on moorings provided by RSC. Racing was finished on Sunday by 13h00 and all visiting boats were on their own road trailers by 14h00. It was a very successful event and three days of good sailing was had by all. The Soling Fleet have been invited back to Rutland Water for the same time next year.